very nice stay. New management just took over the charge .very friendly staff specially Mr. mike (Manager) is very helpful during our stay . They were always smiling and would go out of their way to help us! I would recommend this hotel to everyone! This will be the place for me for now on. Thank you to mike and other staff. Thank you for taking the time to submit this wonderful review.Days Inn Easley is under new management and you will experience this level of service each time you stay with us. Where to begin... First, let's all keep in mind that this was a $70 per night room. I stayed for one night, arriving later in the evening, and leaving earlier in the morning. I didn't want to spend a lot, and the other choices at this price range in the area were either fully booked, or had only smoking rooms. I tried to contact the hotel and was put through to Days Inn reservation center. During the call I was asked about upgrading or becoming part of the membership program.. no thanks... not my usual hotel chain, so just the room... it was a pretty easy affair, and I was about 1 hour from the hotel when I booked. I arrived at the hotel to find the lobby in the middle of a complete gut job renovation. Not a huge deal because I'm not staying in lobby for the night, but still... it was a mess. I was checked in at a dusty single computer in a hallway behind where the renovation was being done by a nice gentleman (I'm assuming manager or owner of the hotel). The lobby area wasn't really clean, and looked sketchy, but again, not sleeping in there. The gentleman did mention that the contractor doing the work was supposed to have finished two weeks ago and walked off the job. Ok, I get it... thanks for letting me know. Due to the lobby construction, breakfast was being served in room 103, just outside of the lobby area - I'll get to that in a minute. I was given a room on the second floor. So everyone knows, the rooms have doors to the outside... not an inside hall way. The room itself was fine... not world class or anything - this IS a Days Inn, so again, temper your expectations. My room was pretty clean, and the bed was comfortable. I found it funny, but the pillows were more like mini pillows, three to a bed - not full-sized, but half of what a king pillow might be - however, they were comfy. The bed was fine, the bath and shower were fine also. During my one night stay, I did notice that the door/front wall of the room was pretty thin... I could clearly hear people talking. I was really tired after a long drive, so it didn't keep me up, but if you're a light sleeper, just be aware that this could be a challenge for you. parking was very limited. I had a trailer and had to create a spot... not a killer because I was able to make a spot, but just know that if you are showing up late, you might not have something in the hotel lot. I woke up in the morning and took a shower... it worked well, good water pressure, hot water, and the soap provided was fine. I packed all my stuff, put it in my car and headed to room 103 for breakfast. Again, Days Inn, not Hampton or something like that, so I have tempered expectations. I open the door to the room and am greeted with a dimly lit, standard size room, with no beds, but a few tables, and chairs not really arranged the best, and an assortment of breakfast items spread out between a dresser and a bar sort of thing with a mini fridge in it. There was a basket of apples, some bread, cereal, orange juice, and coffee out, but for coffee there were only 6 oz cups and no lids... not ideal if you want to take coffee to go. I also found yogurt, frozen omelet things, and milk in the mini-fridge. The toaster and fridge were plugged in precariously from the bathroom area of the hotel room, dangling in mid air... didn't seem all that safe, but ok... I get it, they are under construction. Even still, the breakfast experience was not very good... Limited choices in a limited space, and it just felt... unclean. Fine if I'm at a friends house who's a slob, but not at a hotel, even if it's only $70 a night. If the renovations were done, then I'm sure my experience would have been better - but its not, and it seems like there is not a definite timeline on the completion of those renovations. So, before you book, be sure to call and talk to someone and find out if they are or not. Breakfast could be easily had at the McDonald's across the street - but come on... clean the place up a bit and at least TRY to make it look inviting. Bottom line - the room was fine and served it's purpose. I didn't want to spend a lot and I didn't considering what my options were. If renovations are complete, I could possibly recommend, but for now... take a pass and find something else. Thank you for your feedback. Days Inn Easley is under new management and will make the necessary changes and updates and will unsure you a better stay next time. I don't understand how this motel has 2.5 ratings. I think people except more for what they pay. Anyways we had block of rooms for the basketball game. Our stay was outstanding. Rooms were great and clean. The best off all was the service they provided. We had requested sausages and scrambled eggs for the breakfast and even though they didn't carry sausages and scrambled, they made sure we had those items in the breakfast. Now that's what i call "GREAT HOSPITALITY". I will definitely recommend this hotel to other travelers and sports team. Thank for the lovely 5 star rating. We appreciate your feedback and it is immense pleasure to see that you were satisfied with our services. At Days Inn Easley we try to go out of our way to make everyone stay as comfortable as we can. Thank you once again and we look forward to see you again on your next visit. Great location. Great hot water in the town. Very quiet and friendly people. Its wonderful to see good security camera. Breakfast was ok but doable. Will definetly recommended this place to othee traveller. We do appreciate you taking the time to review Days Inn Easley. Thank you for your feedback and we are working on improving our breakfast options. breakfast Buffett including cheese omelets, waffle, yogurt and fruit, cereals, Orange, Cranberry and Apple Juice, sausage gravy and biscuit, coffee (Regular and Decaf), Three different type of bread (White, Wheat and Cinnamon), Oatmeal, etc.. The preferred airport for Days Inn Easley is Greenville, SC (GSP-Greenville-Spartanburg Intl.) - 33 km / 20.5 mi. 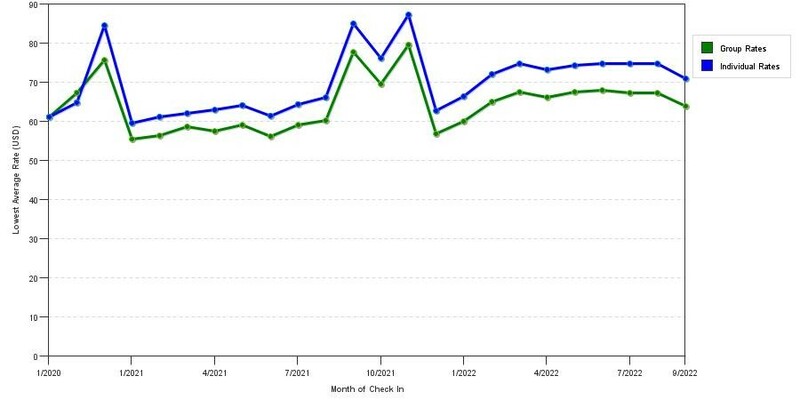 The chart above shows trends of prices for both group/meeting prices and the best individual traveler prices our system could find at the time the group/meeting bid was submitted. The most competitive group discount displayed is 13.5% in the month of June 2017 and the highest average individual rate is $101 in the month of November 2019. This chart will show past seasonality and also project future months. If you are flexible with dates, you may want to consider staying at Days Inn in a month when rates are lower.